One New Aftermarket Replacement Crankshaft Dampener Pulley that fits John Deere Tractor Models: 4040, 4230 (Diesel), 4240, 4240S, 4320, 4350, 4430, 4440, 4455 (Europe, with Engines 6466 & 6076) Fits Excavator Model: 690B Fits Combine Models: 6600, 6602, 6620, 6622, 7700, 7720 Pulley Color may vary. Dimensions: 8.345″ OD x 1.876″ ID Replaces Part Number: AR57241. Our processing system is automated. Thank you for your continued patronage. We carry parts for Engines, Transmissions, Front & Rear Axles, Hitch & Drawbars, Undercarriages, Final Drives, Seats, Bearings, Cups, Cones, Seals, Discs, Couplers, Gears, Brakes, Pressure Plates, Pilot & Throw Out Bearings, Ring & Pinions, Gaskets, Decals and MORE for most high wear items. We also carry replacement parts for the Boom Cylinder (Seal Kits, Tubes, Glands, Pistons, Rods). 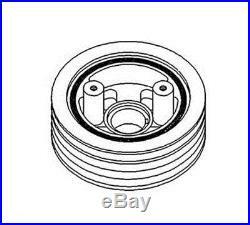 The item “AR57241 New Crankshaft Dampener Pulley for John Deere 4040 4240 4240S” is in sale since Thursday, August 11, 2011. This item is in the category “Business & Industrial\Heavy Equipment Parts & Accs\Tractor Parts”. The seller is “reliableaftermarketpartsinc” and is located in Williamston, Michigan. This item can be shipped worldwide.